If you’re a regular Twitter user you may have seen a while back a company called Edelweiss appeared as if by magic on the beauty scene. 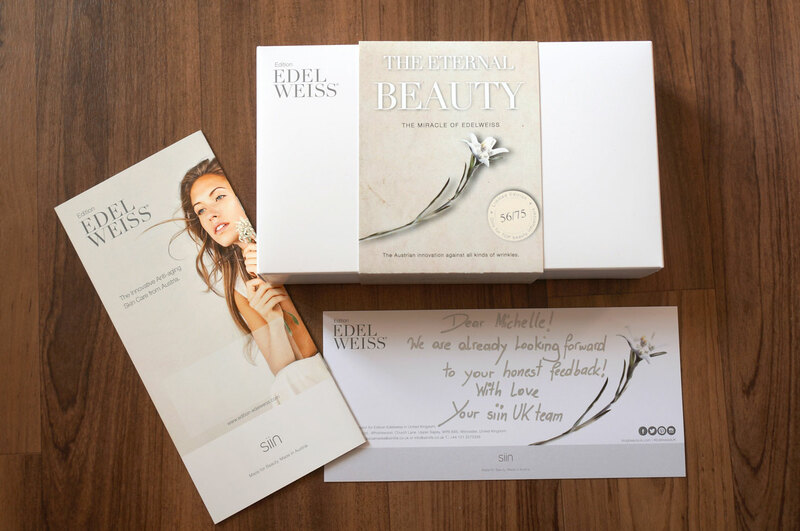 These guys originate from Australia and to announce their arrival with a bang they generously selected 75 UK beauty bloggers to trial their limited edition “Eternal Beauty’ skincare starter set, including a 30ml Milky Cleanser and 30ml 24 Hour Essence Cream. I felt very privileged to be chosen as one of these bloggers! As you can see from the above picture, my parcel arrived beautifully packaged. When I opened the parcel, the inner box was nestled in purple satin, whit woo! I don’t think I’ve ever opened anything so fabulous! Opening the box itself was also pretty cool as both sides slide in opposite directions to reveal the products inside. So, now onto the products! I’ve been using both products for a month or so now, and I have to say I’m really impressed. From first opening the packaging I could tell these were going to be top quality spa-at-home type products, and I wasn’t let down at all! The Milky Cleanser is a clear gel that takes on a ‘milky’ appearance when applied and massaged into the skin. It smells like the perfect high end cleanser, with a light, fresh scent. Velvety smooth spring water from the Alps in combination with the exclusive Edelweiss extract provides a gentle and deep cleansing. The active substances of the vitamin-rich Goji-fruit offer the essential vitamins C, A (Retinol) and B. The extract of the Ginseng root strengthens and protects the skin. The 24 Hour Essence Cream is a fabulous quick absorbing moisturiser, the formula felt light and left my skin feeling soft and supple. The 24h Essence Cream with SPF15 is absorbed quickly and the relaxing and activating effect is perceptible right away. For tired and dull skin – with high moisturising effect for a silky smooth skin. The siin ingredients strengthen the essential skin immune system, stimulate cell turnover and support the collagen production for a firm skin. It helps to prevent the formation of lines and wrinkles and gives a silky smooth appearance.